Do-it-yourself weddings have grown in popularity over the past few years, causing many brides to take a more hands-on approach to planning their weddings. A lot of brides have a knack for creating incredible weddings and receptions without the help of a professional wedding planner. They pull together a beautiful wedding day by making everything by hand, right down to the smallest details. DIY weddings are both modern and chic—they are on trend while still maintaining a homemade, personal flair that captures the true love and personality of the bride and groom. Whether the choice to have a DIY wedding stems from the need to save money or from a love of all things rustic and homemade, we think that DIY weddings are a great way to celebrate. While flowers and centerpieces are an important part of wedding day décor, they can also be some of the priciest items. Many couples allocate at least 10 percent of their wedding budget to flower arrangements for both the ceremony and the reception. Ditch the large, expensive vases and flower arrangements for your wedding reception and try making your own! It’s quick, easy, budget-friendly and fun. Read on to learn how to make stunning DIY centerpieces to add some bling to your reception tables. Yesterday’s newspaper will work perfectly as a work surface. Protect your kitchen table or your grass from spray paint by laying down newspaper while you spray paint your vases. Doing so will make cleanup easy as well. Just roll up the newspaper and toss it in the trash, leaving your work area perfectly clean and paint-free. Make sure you purchase spray paint with a metallic finish. It will give your finished product a little extra shine. If gold does not go with your wedding’s color scheme, find spray paint in a shade that works best for you. Spray paint comes in almost every color imaginable, so there is something to fit every bride’s desired color palette. Almost any container, large or small, could work for this project. Have old vases lying around? Recycle them and give them a face lift. Save empty wine and soda bottles, head to a local second hand store (such as Goodwill) or stop by a dollar store to pick up vases of varying shapes and sizes for a low price. The mismatched look works great for this project, so do not worry if all of your bottles are all different sizes. It only adds to the charm of the finished product! Choose flowers that go with the color palette for your reception. Create your own custom arrangements by purchasing flowers from a local shop or a grocery store to save even more cash. Flowers can help set the tone of your reception, so choose wisely. Arrangements with wild flowers and greenery give off a more rustic vibe, while brighter, more delicate flowers create a classic atmosphere. Now that you have all of your supplies, it’s time to get crafty! If you follow the four easy steps below, your DIY vases will be done in no time. Step 1: Clean your bottles. Soak your bottles in warm water to remove any paper labels. Scrub each bottle with soap and a sponge to make sure there is not any sticky residue left. This will ensure that the bottles are as smooth as possible when it comes time to spray painting them. It is also a good idea to wash any other glass containers, such as vases, that you will be painting to make sure the paint will stick well. Step 2: Set up your work space. Lay out the newspaper on the ground or on a table to make sure that the spray paint does not get on anything. We recommend doing this project outdoors since spray paint can get into the air easily and may stain furniture or other items in your home. In addition to protecting your work space, it is a good idea to wear clothing that you do not mind getting dirty. You will be touching wet paint and spraying it close to your body, and the last thing you would want is to get gold paint all over your favorite shirt! Step 3: Spray paint the bottles. After all of that setup, it is finally time to start spray painting. To start, set one of the bottles on the newspaper. Hold the spray paint can about six inches away from the bottle and spray on several layers of paint to make sure that the bottle is covered evenly. Be sure to spray in even strokes so that the bottle is fully painted and there are no missed spots. Once the bottle is done, set it aside to dry and repeat the process with the rest of your bottles and vases. Your bottles will be dry to the touch in about 30 minutes, but you should let them sit for 24 hours to make sure they are completely dry. Step 4: Arrange your flowers. Arrange flowers of your choice in each vase. When you use these vases as centerpieces for your wedding reception, mix and match vase styles and sizes to create a layered, unique look for each table. Cluster a few vases in the center of each table to create the illusion of a larger flower arrangement. Spray paint your vases solid gold like we did for a classic, luxurious look or paint them with polka dots, stripes, or another pattern that goes best with your wedding theme and color palette. 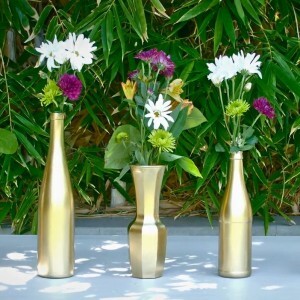 If you’re feeling funky, spray paint a few vases solid colors and a few with a pattern to create a more varied display. The opportunities are endless when it comes to DIY wedding decor. You can make virtually any idea a reality. The beauty of a DIY wedding is that there is meaning in every aspect of the day since the bride has made everything by hand. Even if you are not doing your whole wedding DIY, these centerpieces are an easy way to keep your wedding feeling upscale without the price tag. Need more inspiration? Check out our video above for a visual walk-through of this project! Here’s a fun and easy DIY project. Instead of throwing out your old wine and soda bottles, I am going to show you a way to turn them into stunning centerpieces for your reception. Here’s what you’ll need: newspaper, metallic gold spray paint, and old wine and soda bottles or dollar store vases. Before you get started, you’ll want to soak your bottles in warm water to remove the labels. You can also wash them with a sponge and soap to get all the sticky residue off so they have the smoothest surface to paint. Next, be sure to set up your work space with newspaper, because the spray paint can tend to go everywhere. Now you’re ready to get started. Hold the spray paint slightly away from the bottle and spray it on in several layers, sweeping across the bottle until it is evenly covered in gold. Repeat this process on all your bottles and vases. Now all that’s left is to let your bottles dry. They will be dry to the touch after about 30 minutes, but you should let them fully dry for 24 hours. After that, feel free to fill your new centerpieces with gorgeous flowers for your reception.